This page is not about Watervliet in Albany County, New York, USA. It is not about Watervliet in Michigan. This Watervliet has no Arsenal. And this is not Watervliet the Shaker Village. This is all about the original Watervliet, a quiet rural town in the Meetjesland in Flanders on the border with Zeeland (Zeeland is since 1815 part of the Netherlands). Our Watervliet is known the world over for its beautiful church called "the Cathedral of the North". Here is a word or two about Watervliet's prehistory, mostly translated from a great book called Watervliet, a King's Wish and a Knight's Dream, written by Jozef De Paepe and published by Taptoe in 1999. We tell you about someone the Vikings were terribly afraid of, about a moving love story with a French princess and with a happy end and about the oldest document mentioning Watervliet: a charter of Emperor Otto II dating back to 976, yes the year Nine hundred and seventy six. 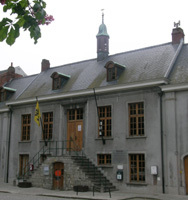 Until 1197 the Watervliet family reigned here and was then succeeded by the Van Praet family from Bruges. And the document goes on, in Latin now: "Haec autem terra jacet circa maritima in loco, qui dicitur Watervlit, et ab incolis loci illius appelatur Abekines Polra habensa plaga meridiana et ab occidenta terra, quanm avunculus meus Philippus, comes Flandriae, praedictus fratribus, contulit contiguam, ab acquilone terra Baldouini di Praet, ab oriente terra Vostrum et Arnoldi, fratris ejus, filiorum Renerii, quam de me tenent. Osthalta is the latinised name of "Oosthout" (Eastwood) in modern Dutch. The name refers to a place situated east of a wood, exactly like Oost-Eeklo, or it refers to a wood that lies east of something else. In any case the village is situated close to Watervliet. It is tempting to suppose that the wood in question might have been a beech [beuken] wood which led to the later name of Boekhoute so that Boekhoute in a previous life had been Osthalta, perhaps in a more or less slightly different place ??? Let's leave that supposition for what it is worth, and scientifically that's not much. Yet we find it touches on the statements of Prof. Dr. Gottschalck, who is convinced that Osthalta lies on the territory of the Boekhoute Corporation and more particularly in a small part yet belonging to the Pagus Flandriensis. It disappeared no doubt in a tempest in the 12th Century. (...) When in 1258 the Van Praet family "acquires" a charter for the new seigneury with the same name it is called "the New Charter" as well as the territory concerned by it. It couldn't be otherwise: there was an earlier charter indeed concerning the small town on the Heerst (Horst) which from then on they would call "the Old Charter". The discussion about where exactly the very first Watervliet was situated continues. In the nightly tempest of 8 October 1375 the waters were stopped by the Heerst (Horst). Perhaps because by then the most violent rage of the storm was spent but certainly because this point (the actual Coquyt Polder) was so close to the safe region on and behind the Heerst, many managed to save their lives by fleeing to the dam that nature had put there centuries earlier. And from that height later on they could see very well the place where they had lived even if very little was still standing of their dwellings of wood and clay. Only the small church made of stone stood out above the water. It would not have been logical for them to wait thirty seven years before damming in the Coquyt Polder (1412). They undoubtedly started work after a short while, no doubt where most of the survivors had had their house and belongings. They reclaimed a small polder (perhaps the name is mistaken). As you can see Watervliet, like so many villages in this region suffered very badly in the floods of 1375-76 when the Braakman was formed. After a period of about 125 years while nothing much changed except the slow building up of sediment, Watervliet was again reclaimed from the sea first by the De Baenst family (1499) and then especially by Hiëronymus Lauwerijn, a nobleman from Bruges. It was his intention to give Flanders a new sea port in the "Freedom of Bruges" when the silting up of Damme and then Sluis made those ports totally unusable for seagoing ships. His new port was meant to compete with booming Antwerp that then belonged to the Duchy of Brabant. 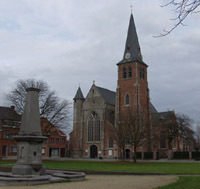 In 1500 Watervliet became a seigneury and Hiëronymus Lauwerijn became its seigneur. A 1504 charter declared Watervliet to be a city. And soon Lauwerijn built yet another dyke called Philippine after the reigning Duke Philip the Handsome (Felipe el Hermoso). Lauwerijn was his adviser, chamberlain and tresorer. Philippine, the town, soon also gained the status of seigneury. In 1506 it was beholden to the "Leenhof" (Rented Farm) of Watervliet. Lauwerijn's dreams of a new port for Bruges at Watervliet never materialised but we still have the "Cathedral of the North" and a particularly rich history to look back on. This "Cathedral of the North" stood just next to the port. Its style is Brabant Gothic. Work on the church was started in 1501. But the spire dates from 1893. The religious troubles with Watervliet on the border with Protestant regions created their own problems. There were disturbances and dykes were pierced but the damage to statues and other works of art was limited. The same edict also ordered that graveyards had to be built outside the cities and outside the town centers and that inhumations were allowed only there. Watervliet's town council addresses a petition to the emperor. The letter (in French) described the actual cemetery and explained that the roads were in such a bad state especially in Winter that it would be impossible to transport the dead outside the town. Besides in Winter all the fields are inundated and it would be impossible to find a suitable place for a new graveyard. This letter gives us an idea of what Watervliet must have been like in Winter. The part of the graveyard that was often inundated, must have been the northern part, which is lower even now. The arguments were convincing indeed, because three months later, on 20 October 1784, comes the answer: "His Majesty, after consultations with the illustrious governors-general of the Netherlands, has declared and declares that for the time being they may continue to bury the dead in Watervliet's current cemetery. And so this place is exempted from what is prescribed by the articles 2 and succeeding, of the edict of 26 June last." During the last French period the executive commissioner was a native of Watervliet, R. G. Dubosch. He did his utmost to make things as depressing as possible for his compatriots and it was in Overmere, in his Escaut "Schelde" Department that the revolt exploded in what is now known as the famous "Boerenkrijg" or Farmers' Revolt. If you read that page you'll know more about this historical event than 95% of the francophones. Napoleon's defeat at Waterloo in 1815 meant the end of the French period and the beginning of the Dutch backlash. With the revolt against the Dutch in 1830 an independent Belgium was created (or allowed) and with it came a backlash against everything Dutch (and Flemish). On 2 August 1831 William I of Orange, the Dutch king, managed to conquer two locks in Watervliet and a subsequent "Treaty of XXIV Articles" deprived Watervliet of a piece of its territory that had belonged to it since 1648. The most recent and let's hope very last great feat of arms here was Watervliet's liberation in 1944 after weeks of fighting between the Germans and Canadians for control over a stretch of the Leopold Canal. 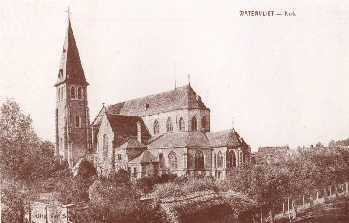 Watervliet and its church were badly damaged. Church spires were used as lookouts by both sides in the conflict and that made them prime targets. The liberation of Watervliet also cost the lives of 40 civilians. Watervliet measures 2,107.65 hectares (5,206 acres). On 1/1/2004 its population stood at 1,598 souls. And according to the official website of Greater St.-Laureins to which Watervliet now belongs that total had climbed up to 1,628 exactly a year later. "Le Bulletin Officiel" van de Touring-Club de Belgique.